Find the perfect teacher or instructor in West Anaheim for private violin lessons in your home or in their studio. Check out some of our most popular teachers near West Anaheim including Los Angeles, Long Beach, Irvine, Glendale and Burbank. I have been teaching violin privately and in the classroom for several years now. I am finishing up my education in violin performance, and I will be continuing to a master's degree in violin performance within the next year. I try my best to adapt to my students individual learning styles. Everybody is different, and it's my goal as a teacher to have my students reach an understanding for music and hopefully grow to have a love for it as well. I started my path as a violinist when I was 7. My childhood and youth years were fool of performances, master classes and concert tours. After starting my Bachelor's I began working in orchestra and I loved my job from the very first day! I played my favorite musical instrument and the music I loved, travelled the world and met a lot of interesting people. Starting from 2013, couple of years after receiving my Master's degree in violin performance, I started teaching violin to students from 5 to 99 years old. Many of them are my good friends now. So let's discover the world of music through the most beautiful instrument in the world - Violin! Much of my methods are derived from my doctoral dissertation studies in the field of Sports Psychology. I apply my teaching methods to develop and increase control of muscular and mental functions, accuracy, precision, discipline, mental awareness and overall coordination in violin performance. I am eager to share my knowledge and experience in sports psychology and to emphasize the general psychological benefits and contribution to human enrichment. My teaching principles are based on outlining the advantageous mental and physical practice techniques revealed through research in Sports Psychology. These methods help my students strategically overcome the numerous psychological obstacles in order to develop a consistently high level of performance. owledge of Sports Psychology in my lessons, I hope to educate about the existing relationship between mental process and physical execution and the impact one has on the other. For professional athletes and musicians, performing under pressure is an inescapable element of their careers. Given the current levels of performance excellence and the consequent fierceness of competition, consistency in performance quality is indispensible in attaining the degree of professionalism. This implied link between musical and athletic disciplines is a logical one. Similarly to athletes, musicians must achieve high levels of technical skill, efficient movement patterns, acute focus, composure and extreme concentration, all while maintaining a consistently high level of performance. Musicians ‘play’ music as athletes ‘play’ sports. Therefore, like sports, a musical performance is a physical activity with extreme demands on technical facility, training ethics, discipline, deliberate practice, structure, dedication, determination, motivation and inspiration. Like sports, it is a form of self-expression, performed in front of an audience and demanding astounding mastery of the human mind and body. Both performance practices provide the performer with opportunities for excellence, though the journey may bring forth intense pressures, challenges, anxieties, fears and psychological phobias. Adapting the methods and principles developed by research in sports psychology, affords tremendous advantage in a musician’s constant desire to elevate, not only the quality, but also the consistency of quality in their performance. A true professional and a great teacher! I have been taking violin lessons now for 6 months with Dr. Dimitri Olevsky, having switched to Dimitri after having had a mediocre experience with my previous teacher. Wow…what a difference. Dimitri ably blends his extensive knowledge, talent, and seriousness about his craft with a witty sense of humor. He is able to simplify the complexities of violin technique so that it is truly feels accessible. Highly recommended. Dr. Olevsky was immediately able to improve my playing with direct, practical advice. He is concerned with efficient practice and in making the maximum amount of progress in the time that one has. He is highly knowledgable about the audition process and the real day to day of being a professional performing violinist. I have been playing for 15+ years and find Dimitry's lessons very challenging and stimulating. I started taking violin lessons from Dimitry two months ago and I can definitely say that he taught me a lot of things I didn’t know before. I had some violin background as a kid years ago and he made me realize what I did wrong and gave me so many tips to correct my mistakes and learn the right technique. There is no need to say that he is really talented and one of the best teacher you can find. I’m really glad that I was lucky enough to learn a lot of things from the pro and had a chance to see him play with me. Anna K. is an lifelong improvising violinist with an eclectic array of influences. She has been an active collaborator in studio and on stage with a broad range of artists and bands in the alternative music field — as a violinist she’s known for her strong melodic and rhythmic improvisational skills, great ear and technical proficiency in jazz, classical, and American roots idioms. After finishing her jazz performance and songwriting studies at Berklee College of Music, Anna moved to New York City and worked as a professional violinist, vocalist and composer for several years. There she wrote, performed, and recorded with a multitude of songwriters, bands, multi-media performance artists and Broadway sound designers, lending her well-versed and unique improvisational style to a wide variety of musical projects. Other artistic and personal pursuits eventually led her to California, where she recently returned from to settle in the Hudson Valley with her young son. Anna is an lifelong improvising violinist with an eclectic array of influences. She has been an active collaborator in studio and on stage with a broad range of artists and bands in the alternative music field — as a violinist she’s known for her strong melodic and rhythmic improvisational skills, great ear and technical proficiency in jazz, classical, and American roots idioms. After finishing her jazz performance and songwriting studies at Berklee College of Music, Anna moved to New York City and worked as a professional violinist, vocalist and composer for several years. There she wrote, performed, and recorded with a multitude of songwriters, bands, multi-media performance artists and Broadway sound designers, lending her well-versed and unique improvisational style to a wide variety of musical projects. 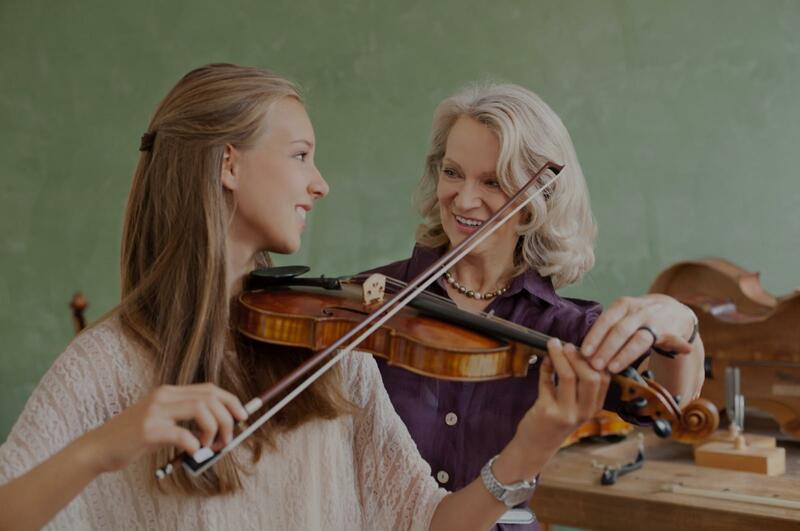 private violin students for 17 years, and happily offers instruction to players of all ages and levels. Lessons are catered to the student, allowing each individual’s musical interests and proficiency level guide the process. Anna is also a certified beginning Suzuki Violin teacher, and is a warm, kind and thorough teacher. Students must come with their own violin. If you have any questions about how/where to obtain one, feel free to ask. It was a great learning experience. Looking forward to next lesson. Anna is a wonderful, positive teacher. She's clearly had a lot of experience working with children and is a mother herself. My daughter looks forward to her lesson every week, and thanks to this she's eager to practice regularly and is seeing a ton of progress! Thanks, Ms. Anna! "Brandon is a wonderful violin teacher he takes time to teach you the music and learn to read the notes in a methodical way." Los Angeles, CA teacher: Brandon E.
"Tigran is a great teacher! s my honor to have such a high-level violinist as my teacher. The same piece of music sounds a world of difference when he plays it. Besides, he is a teacher with integrity. He doesn't choose the easy way of pleasing me with compliments, but instead he points out the source of my problems and wants me to work on them. He also taught me unique effective ways how to improve my violin skills. As a Chinese saying says: "good (Chinese) medicines taste bitter". In order to improve my violin skills, Tigran has the courage and integrity to prescribe the bitter medicine that I need rather than to give me useless placebo. Now I start to feel the joy of playing better. And there is so much more progress to look forward to with Tigran as my teacher! Tigran is the right teacher for serious students." "My daughter was so excited to show me everything she had learned. I was really impressed that she could remember the names of the strings and parts"
Los Angeles, CA teacher: Joe M.
"He is a very talented teacher." "Amazing experience. Can’t wait for the next lesson. Nicholas was patient, knowledgeable and we loved the format of the lesson." "Very knowledgeable and patience, we are lucky to have picked her." Los Angeles, CA teacher: Jill Z.
e was a bit impatient and short with me (how does she teach children??! ), so I tried Nick due to his location from my home. He's been fantastic! He's a great combo of being patient, caring, and encouraging, but also stern enough to get me to do what I need to get better. I'm sure it's not easy working with an adult that can "talk back" haha. He clearly knows what he's doing and he helps motivate me to keep learning. And he's very understanding when I run a tad late sometimes. I imagine he'd be great with kids too if he's great with a difficult adult like me." er lesson every week, and thanks to this she's eager to practice regularly and is seeing a ton of progress! Thanks, Ms. Anna!"